For this investor, it’s all about the future potential of this bellwether dividend payer. Shares of Verizon (NYSE:VZ) are rallying after reporting a strong showing in the third quarter of 2017. While all the focus is rightly directed at the company's wireless subscriber base, there is more going on behind the scenes that make this stock an exciting long-term investment. 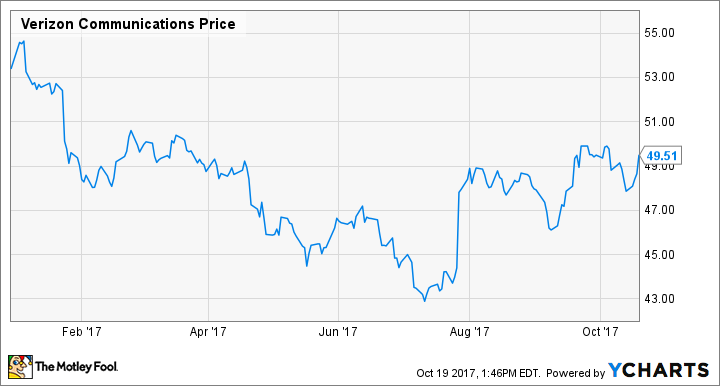 Verizon's stock has underperformed the market this year as investors have fretted over the business foundation: Wireless subscribers. However, due in large part to the rollout of unlimited data plans to keep up with smaller competitors like T-Mobile (NASDAQ:TMUS), Verizon is back in subscriber growth mode with 603,000 net adds in the third quarter. Chart by author. Data source: Verizon quarterly earnings. Highlights from the quarter also included the Fios division, Verizon's video and internet service, growing revenue by 4.8%. The AOL and Yahoo! media divisions, reorganized as the Oath brand, had revenue of $2 billion. Management said the full integration of the two online media companies was ahead of schedule. Over the last few years, Verizon has been quietly acquiring small Internet of Things (IoT) businesses and organizing them into a new operating segment. Organic revenue growth, which excludes any bump from acquisitions made in the last year, was up 13% in the third quarter. The company can be a bit cryptic in explaining this small department, giving revenue figures for telematics -- the connected vehicle and fleet management businesses -- but only giving revenue growth percentages for the IoT division overall, which includes telematics. Telematics growth has seemingly stalled after Verizon bought its way into the industry last year. With annualized revenue of just under $900 million, the company has cut a small piece of the market share pie, estimated to be at just over $7 billion this year. However, estimates say the industry will grow to over $18 billion by 2022. That makes this currently insignificant Verizon segment something to pay attention to. The overall IoT segment is fuzzy with only an overall percentage to work with. What we do know is that Verizon has made a handful of small purchases ranging from connected commercial lighting to smart city businesses. The figure likely includes Verizon's work on the future 5G network, which is now being pilot testing in select urban markets. An announcement was made earlier in the week that partner Qualcomm (NASDAQ:QCOM) will begin testing its hardware on Verizon's 5G network in 2018, with the expectation that 5G modems will begin shipping for commercial use in early 2019. While wireless subscriptions continue to be the primary focus for investors, Verizon is ramping up its future business and finding ways to monetize it even now. The future 5G network, which touts faster speeds and lower latency time, will do more than provide a faster network for smartphone users. It will be the network that powers the future of technology growth. What that means is that Verizon is positioning itself as something more than an enabler of mobile phones. 5G will carry the information needed to power the IoT: autonomous vehicles, connected healthcare, smart homes, and smart cities. The quarter was a win because of the strong addition of new wireless subscribers, but for me this stock is all about the progressive rollout of that small IoT business segment.